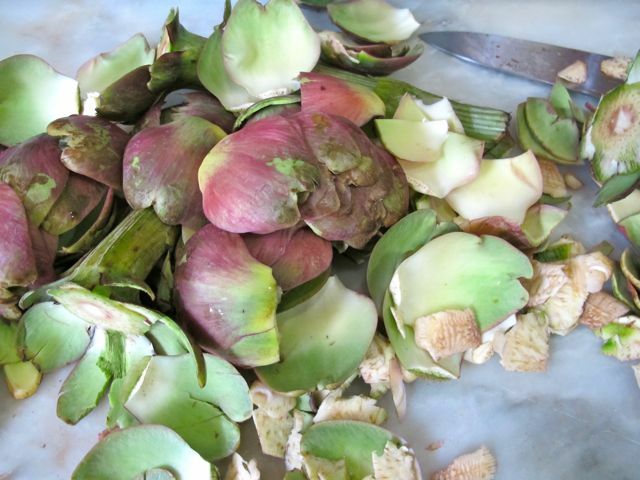 The small and still tightly close “petals” of the fresh artichoke could easily have been incorporated into the floral arrangement. 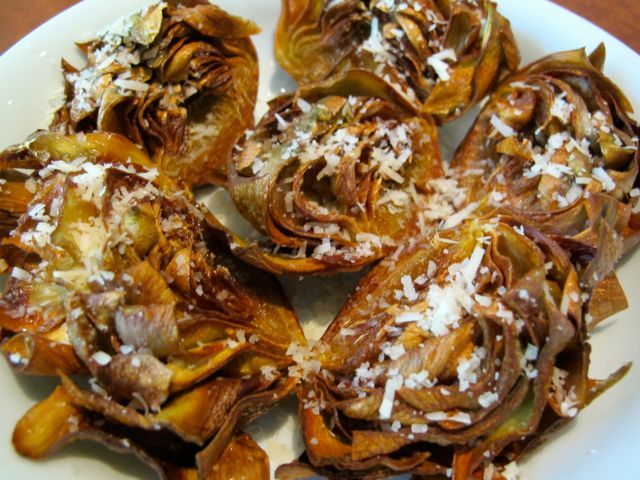 But we haven’t eaten artichokes in a while, so we were definitely having these for lunch! We had a lot of tomatoes on hand, so we decided to make a simple fresh tomato sauce using 4-5 different locally grown tomatoes. Just add several tablespoons of olive oil to a pan, 2-3 cloves of garlic, sliced paper thin, and when fragrant, not browned, add some 5-6 cups of chopped and somewhat de-seeded fresh tomatoes over high heat. Salt generously and reduce until a saucy consistency. Meanwhile, boil up some cappelini or angel hair pasta, and when done, add this to the tomato sauce with a bit of pasta water, perhaps a cup or less of cubed mozzarella cheese and toss to mix. Add a handful of wild arugula leaves (or basil if you had it) and toss once more… serve immediately. I haven’t tried artichoke. With your post I feel like I’m missing out on something by not being more adventurous with food. What does it taste like MM? I’ve never tasted fried Artichokes but it does look yummy! And your pasta..looks divine!! 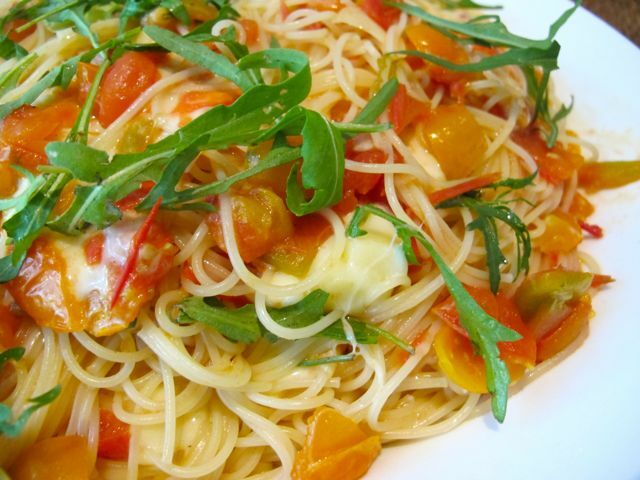 !…Nice twist with the use of arugula instead of the usual basil. Love this post! Whoa! a healthy alternative! no meat? fish? 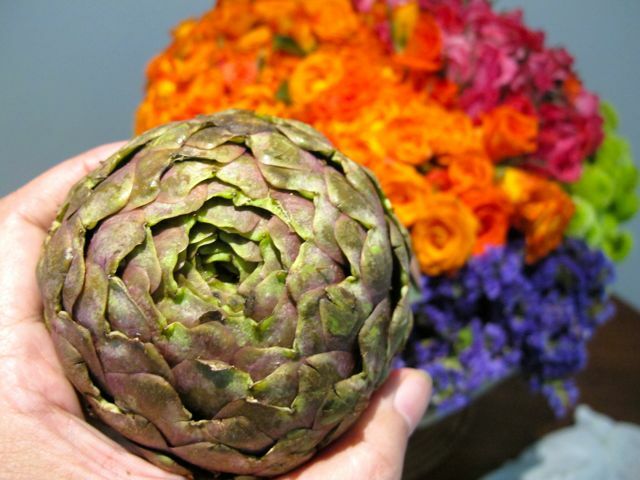 aaahhh…..that’s a good looking artichoke. If only I can be very fortunate of finding them as fresh as you photographed them, I would have them right now even if they require so much work. 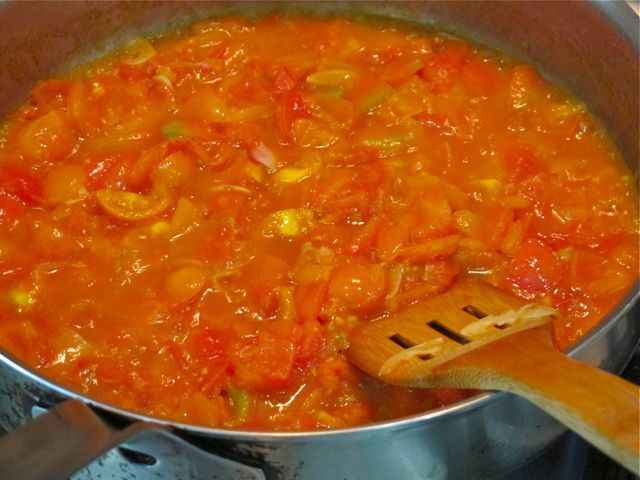 And the fresh tomato sauce….aaahhh, comfort food on cold days like this. Looks like I’ll have them on Friday!!! Thanks MM! Where I was based in Spain…. Valencia blessed with sun there are artichoke plantations everywhere… (yes I am missing Spain now). The crew just them boiled and dip on vinaigrette. 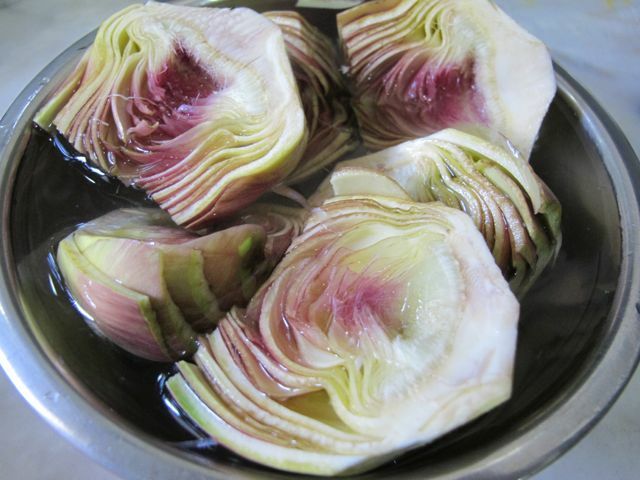 I’ve had artichokes steamed but, not fried…will soon try it. You got me curious. Now I have to try your recipe by frying them. I have had bottled artichokes and as tapenade (I loved it). I’ve also had it simply steamed then dipped in butter with lemon zest (using teeth to scrape the insides of the petals) but never deep fried. Yum! I love artichoke hearts, but have never had fresh artichokes, much less deep-fried. The deep-frying and resulting crispiness and caramelization must add a different layer altogether! My favorite artichoke recipe is the artichoke-spinach dip. Chunky pieaces of artichoke with spinach, sour cream, cream cheese and grated parmesan mixed together and baked in 300 degrees for 30 minutes. Do they even have artichoke in the Philippines? Deep Fried Artichoke, I’m iffy about this one. Marketman, I would love try your lechon though. I will visit your place when we decide to visit the Philipipines.